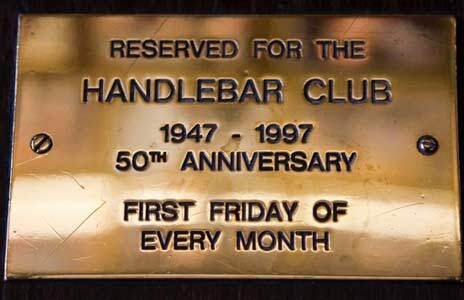 Ever since the early days of the club, we have held a London meeting on the first Friday of the month, and for over ten years the venue had been The Windsor Castle Pub in Crawford Place, Marylebone, London. 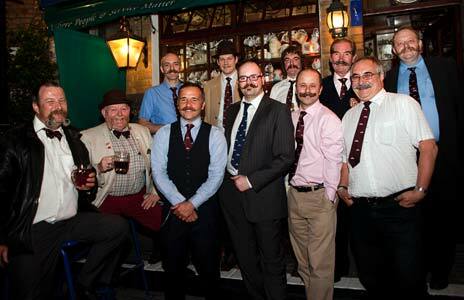 This was a typical English pub, full of memorabilia, having on display various Handlebar Club trophies and photographs. We are now sad to discover that The Windsor Castle will be closing permanently before our next first Friday meeting in September 2016. However, we will be decamping around the corner (with all our club memorabilia) to The Heron public house, Norfolk Crescent, London W2 2DN. This will be our temporary home until the AGM where we can review our situation. The numbers are rather variable, but we usually have around twenty members, together with some wives, girlfriends etc. We arrive between about eight o'clock and half past eight, and those of us who don't have to catch trains often stay on until closing time. Members outside The Windsor Castle. The sketch map below should give some idea of where to find the pub, and shows the location of The Heron with respect to The Windsor Castle. If coming by car, parking is possible in the evenings on the streets nearby, though it sometimes involves driving around for some time to find a place. If coming by public transport, it is perhaps fifteen minutes walk from Baker Street underground, ten minutes from Marylebone, or around five minutes from either of the Edgware Road stations. Friday 2rd June 2017 First Friday meeting at the The Heron. Friday 7th July 2017 First Friday meeting at the The Heron. Friday 4th August 2017 First Friday meeting at the The Heron. Friday 1st September 2017 First Friday meeting at the The Heron. Friday 6th October 2017 First Friday meeting at the The Heron. Friday 3rd November 2017 First Friday meeting at the The Heron. Friday 1st December 2017 First Friday meeting at the The Heron. The WBMA World Beard and Moustache Championships.